1st 2016 Training Day - 27th January!! I have been informed by Mike Purkiss of a meeting, which he has arranged. As a matter of course, there is usually no training day in January, but this evening meeting on Leadership Skills, led by Dr Richard Jones from QAH should be well worth attending. I understand the plan will be for a 17:30 start at the Holiday Inn, Eastleigh. There will be a presentation until 20:00, followed by dinner. Given the start time it is likely that people would have to leave work early. Could I ask everyone to clear this with their current rota coordinators so that new arrivals to your respective trusts will be able to attend. At this stage, I'm not sure if registration is required but I will be in touch with details once they are available. Please follow this link for a course which may be of interest to some of you. I am considering going myself just to find out how a whole day can be dedicated to arterial punctures - and it is free. Also... just another reminder to complete the Wessex Trainees' Survey, if you have not already done so. A one day conference on cardiomyopathies will be held locally, in Bournemouth, on 30th November 2015. Whilst I acknowledge that I might think that this is more interesting than some of the rest of you, it does look like a good programme. This can be a tricky area of the curriculum to get good exposure to, and I'm sure that Catherine Mercer's talk will be of great value in this regard. Booking can be made by following this link. As the advert points out "Registration is FREE"
Please could I ask you all to follow the link below to the Wessex Trainee's Survey 2015. The Survey is STRICTLY ANONYMOUS and will be of great value in highlighting training concerns in the region at the next STC. I will combine this data with the BJCA survey data to help improve training locally. It's only 10 questions and shouldn't take up much of your valuable time - the more of us who complete it, the more weight it has as feedback to Dr Calver. Please also feel free to e-mail me with any specific training concerns prior to the STC meeting on the 16th October. Apologies, but due to an oversight on my part I am publicising this at rather short notice. The meeting is to be held at Basingstoke and will constitute the October Wessex training day. The BCS has advertised this course, and hopefully, interventional types will be well aware of it and planning to attend. It is free to BCIS members, but there is a joining fee of £50 which could be recouped from study budgets as necessary. Registration is required and places are still available - please follow this link. The programme can also be accessed there - unfortunately, I cannot upload it from work but a text version is shown below. 13.45 SESSION 4: CEREBROVASCULAR INTERVENTION…. IS STROKE THE NEW STEMI? Once again, sorry for the short notice. The training day tab has been fully updated to show events for the rest of the year so please do take a look at it and plan your study leave accordingly. Such is my commitment to this that I am blogging from my holiday. NHS Employers is holding a series of regional meetings to discuss the proposed changes to junior doctors' contracts (which, in my view, are shameful). These will, hopefully, be an opportunity to raise concerns and so I would urge as many people as possible to attend the local meeting at St Mary's Stadium in Southampton on 27th October - 18:00 - 20:00. Benoy Shah has asked me to publicise this meeting which will no doubt be of interest to some of you. The flyer can be accessed here. Apologies for the slightly poor quality but it has been sent to me in this format. For more information you can visit www.bhvs.org.uk. Please also don't forget about the SECMR meeting next week as well as the Imaging Training Day at Basingstoke on the 23rd September. I'm off on holiday now that my PYA is out of the way. I wish everyone else a happy ARCP. Firstly - apologies for the mistake in the last post. The SECMR is on 15th SEPTEMBER (next week) - I have updated the post accordingly. I would be grateful if you are an HF subspeciality trainee or are considering this (and if so congratulations on an excellent choice...) then you could e-mail me with the answers to the points above. The 4th SECMR meeting is scheduled for Tuesday 15th September. This is the day of most of your ARCPs and so a good opportunity to meet up afterwards for a moan, some wine, and a bit of education on CMR in ACHD. On a serious note, the meeting is always excellent, and support by way of attendance is the only way to ensure that Andrew and JP continue to put on such high quality regional events. The link to register can be accessed here. Anyone interested in presenting a case should contact Dr Flett directly. I have been asked to circulate details of this meeting which is apparently so popular that the first release of tickets has sold out since I was e-mailed about it this morning. The programme is designed to cover key aspects of the core curriculum with an excellent faculty - it can be found here. Apologies for the slightly short notice but I have been made aware that the next training day will be held on Wednesday 23rd September at Basingstoke. This has been rescheduled as the original date had been planned for the same day as the ARCP. According to previous information, I understand that the topic of the day will be TOE. I am aware that there is slightly less than 6 weeks notice of this date but please see if your current posts will be accommodating and give you leave to attend. I will be in touch with full details once they are available. Please can I also remind everyone to fill out their Form R, if you have not already done so, in preparation for the ARCP - Best of luck to everyone with these! Jim Stirrup has asked me to advertise this day, run jointly by the BSCI and the RSM. It is the second part of a three part programme on cardiovascular imaging. Jim assures me that there is much to be gained by attending, and there is no mandate to attend all 3 parts. Please see below for details of the Portsmouth training day to be held this Thursday (9th July). This is always an excellent day with some good opportunities to get familiar with Medtronic programming (other device manufacturers are available...) I'm sure that the addition of Kenny to the faculty can only improve it. From memory, the lunch is also excellent. The Marriott is very close to QAH - directions here. Some of you may have been invited to this event by local MSD reps but I thought I would highlight it here. This is probably a good opportunity to put something in the lipid box on e-portfolio and anyone interested in attending should e-mail Balwinder Digbal-Singh. Just a reminder that there is a regional GUCH study day at Southampton on 8th May. Anyone interested in attending should e-mail Sajid Aslam for more details. I have been asked to advertise this 1 day meeting at Bournemouth, which may be of interest to those of an interventional bent. There will be the opportunity for hands-on training in circulatory support devices, such as the Impella, as well as a series of lectures on the rationale and evidence base for circulatory support in high risk PCI. It would appear to be free to attend, courtesy of industry support by Abiomed. The programme can be accessed here. John Rawlins tells me that the guest speaker is well worth hearing. Please can everyone also remember to complete the BJCA survey - it only takes 15 minutes and is key in helping to shape training. Jim Stirrup has asked me to advertise this meeting, to be run on Thursday 30th April and Friday 1st May. The programme is pretty multi-modality and is suitable for all cardiology trainees vis ePortoflio requirements for core training in non-invasive imaging. It is not really a day designed for the cardiac CT subspecialist only! The BSCI is in fact running a shared meeting alongside the BSCMR (one after the other) and, although the flyers don’t yet say so (updated versions are being drawn up), there will be a discount to people who attend both. A link to the programme and registration details can be found here. To register please visit www.bsci.org.uk. The next Congenital half day is due to run on 19th March, starting at 13:30. The topic is the double outlet right ventricle. Those interested in attending should e-mail Debbie Dashwood by clicking. Registration should be free for those in the Wessex region. KBA Registration Deadline Approaching - End of this week! Dr Calver has asked me to forward this on - ST5s please take note and ensure you register prior to the deadline. The date for this years' European Exam in General Cardiology (formerly the Knowledge Based Assessment or KBA) will be Thursday 18 June 2015. 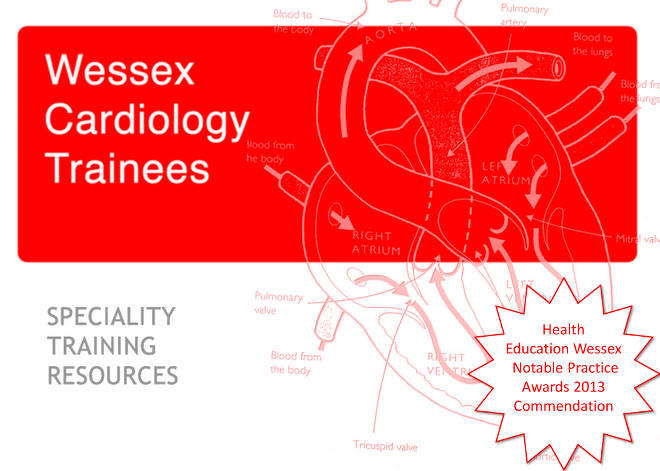 The exam is run by the European Society of Cardiology (ESC) with the BCS acting as liaison with all UK candidates, and will be held in Pearson Vue exam centres across the UK on Thursday 18 June 2015. Online registration is open on the BCS website (link below) until 23:59 Friday 27 February. Trainees can go through to the registration system and pay for their place using a credit/debit card. The fee for 2015 is £400. Once you have registered and paid for your place, in April 2015, you will be sent an email from Pearson Vue with your booking information, and confirming at which test centre, and at what time, you will sit the exam. The BCS will email you 1 month before the exam date with further details. If you have any questions about the exam, please contact Neil Smith at the British Cardiovascular Society on smithn@bcs.com or call 0207 380 1915. Many thanks in advance for your assistance in this matter, and please feel free to contact me on the below details should you require any further information or assistance. There are a few places remaining on this, very good looking, course in London 10th - 14th March. Delegates will have the opportunity to review ca. 300 cardiac CT scans with 20 hours of lectures & interactive teaching. Each delegate will have their own cardiac CT workstation. Please follow this link to the course website for further details. The course director, Dr Ronak Rajani, has suggested that it should be possible for Wessex trainees to attend for the reduced rate normally only available for King's Staff - £1400. This represents a significant saving on the advertised rate. Those interested should email the Philips representative using this link to secure booking at the reduced rate. Please follow this link for the flyer. 21st Annual Transoesphageal Echocardiography Course, 16-17 April 2015, Michael Heron Lecture Theatre, St George's Hospital, London - Please follow this link for more information. Liverpool Hands On Cardiac Pacing Course, 18-19 June 2015 - Please see the flyer here. Prof Curzen has brought this to my attention - looks like a great training opportunity for those planning to pursue intervention as a career. The flyer can be accessed by following this link. Dr Rakhit has asked me to publicise the inaugural PFA and FA Cardiology in Football Symposium, which will be held at Wembley on the 27th March 2015 prior to the England vs. Lithuania Euro2016 qualifying game. The programme will cover the FA screening programme, the effects of exercise on the heart and the overlap with heart muscle disease. The faculty is internationally renowned in this field and the range of topics to be covered looks fascinating. As well as Sanjay Sharma, Stricly's Fabrice Muamba will be on the bill - so there is something for everyone! Registration is £90.00 and, from what I can see, includes a ticket for the match afterwards. Follow this link for the flyer. I have been asked to publicise this comprehensive looking echo course, organised by Dr Nav Mansani - former head of the BSE. For the flyer, please follow this link. Unfortunately, the details have only been passed to me after the early-bird registration date has passed so it is a hefty £650.00. The programme does appear, however, to have been designed to be clinically relevant and it looks like a great overview of commonly encountered echo diagnoses. Anyone interested in being part of this can contact her by clicking here. Apparently this is now called the EEGC. In any case, those who are ST5 this year should remember to register by the 27th February via the BCS website. I hope everyone is settling in to their new posts.